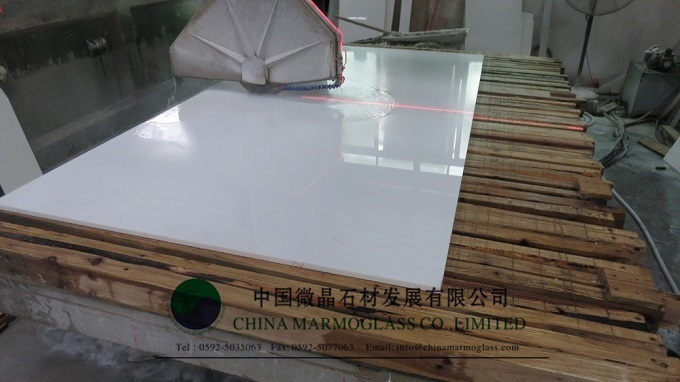 How to cut Nano Glass-welcome to china marmoglass, nanoglass, nano crystallized glass panel crystallized glass panel,crystallized white stone,white marble,minicrystal stone. tags: wholesale Nano Glass Cutting Diamond Blade, Nano Glass Cutting Diamond Blade suppliers, Nano Glass Cutting Diamond Blade factory. As Nano-crystallized glass panel is more and more popular in making countertop,vanity top,and even wall cladding, this Blade/Disc is a good solution for fabricators to cut this material,without worry of edge-crack,unable to cut,etc. Nano-crystallized glass is manufactured from a blend of natural materials that is 75 percent silica and 25 percent other natural minerals. The mixture is poured into a mold to form either a slab or a tile, and it is heated to a temperature ranging from 1,550 degrees Celsius to 1,800 degrees C. for 24 to 26 hours. The high temperatures and the length of time align the molecules of the glass on a nanoscopic scale, which it retains upon cooling and hardening. Slabs of nano-crystallized glass are commonly available in sizes of 12 ft. by 12 ft., 16 by 16 ft. and 18 by 18 ft. with thicknesses of 3/8 in. or 1/2 in. Tiles are usually made to 24 in. by 24. in. by 3/4 in. Most slabs and tiles are polished by default, but they can be given a CNC satin finish. In addition, the material can be convexly or concavely manufactured for basins and other custom designs. cutting of nano-crystallized glass is usually accomplished with continuous blade saws, but it can also be honed, chiseled or sandblasted. The edges can be ground to a bullnose or chamfered. Remnants are 100 percent recyclable. Heat and sharpen the blade for at least 15 minutes before starting any cutting. You should also make sure that you have sufficient and constant cooling water throughout the process. You should also be sure to check if the cutting table is stable as its balance can cause damage to the stone. Be aware of the cutting speed during the process: the regular bed / table speed should be between 2.5 and 4m / min. To cut an China Nanostone, the first cut should be the length of the plate and the second, in the direction of the plate width. For cuts made in sheets above 18mm we recommend to make the cut in two steps. In the first step, one blade should reach half the plate and in the second step, it should cover another half to finish the cut. To perform this procedure a plate cannot have any lateral movement. It is imperative that the disc is perfectly aligned with a cut direction. 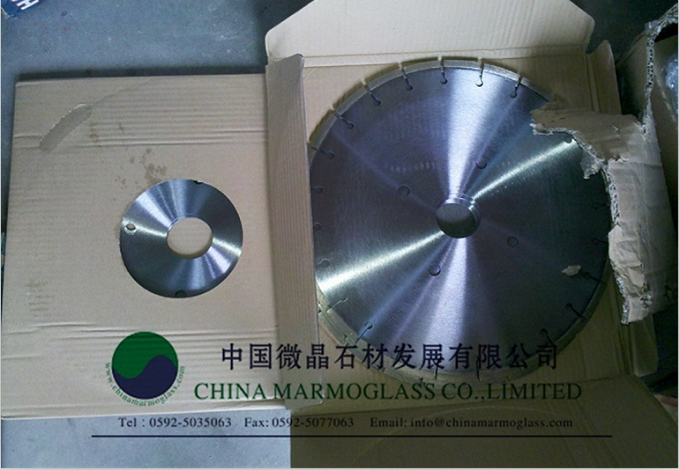 CHINA MARMOGLASS CO.,LIMITED can offer you the right cutting discs when load the container from us.